::: Off the Radar :::: Nitzer Ebb Tix Giveaway! 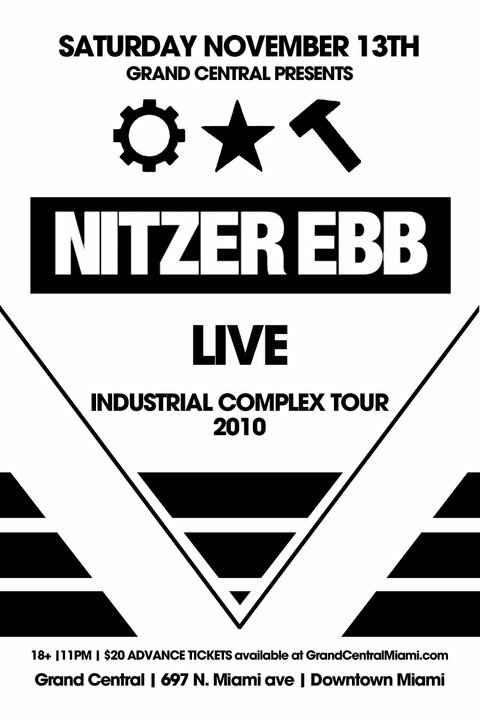 Another big show happening this Saturday, November the 13th at Grand Central here in Downtown Miami is Industrial legends Nitzer Ebb! Grew up listening/dancing to this band in my youth at the goth/industrial clubs and I'm sure their live show will be nothing short of spectacular! I mean the music lends itself to a great live show experience. Pounding drums, swirling synths and dancey beats will make for tons of dancing and fist pumping. Our friends over at GC sent us a pair of tixs to giveaway for the show to one lucky OTR reader. Just comment below with a valid email and I'll pick a random winner Friday. Good luck!! If you'd like to purchase tickets you can get them here or at the door on the night of the show. Here's a video for one of their classic jams "Murderous". This one and "Join in The Chant" were two of my favorites back in the day. Congrats to Vanessa (aka VaneTurtle) for winning tixs to see Nitzer Ebb Sat!